In a way most of us weren’t shocked to hear the news last night that New York Red Bull striker and Designated Player Juan Pablo Angel was most likely not to return to New York after this season. When asked last night on the broadcast of the US-Colombia game if he would return next year to the Red Bulls he said “I probably won’t”. That’s bold for a guy that’s in the middle of helping his club go for a MLS Cup run right now. But again I doubt many of us were shocked by the news. Its not like the writing was on the wall or anything or that JPA was in the doghouse for Hans Backe. No, it just seemed like it was a matter of time before this sort of thing would happen. A DP leaving a MLS club when his contract ran out. There’s little doubt that he’s been the truest of DPs since joining the league a couple years ago. His goal scoring ability and play on the field for the Red Bulls have been everything we hoped the DP-type players would be. When you think of DPs he’s one of the first that should come to mind, not David Beckham or Thierry Henry (though Henry will likely be a very good DP when its all said and done). Now the question becomes, what happens to JPA? Also where will New York go from here? I’d imagine it will be a mutual split between the two. Either he’ll get picked up somewhere else in the world or another MLS club will give him a DP contract (New England anyone?). 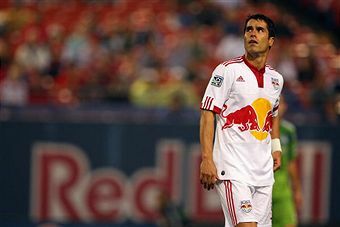 The Red Bulls will once again go out and find another big name to fill the third DP spot on the roster. I’d imagine this time around it will be a playmaker in the midfield and not another striker (they have Henry to fill that). “Probably not”? I heard “no”. Pretty ignominious statement from JPA.